As of 23:45FR we will no longer be accepting dragons for raffle. There are a couple of other ways you can earn tickets. I will also look back and fix any errors that are posted in this thread from beginning of raffle until I pnig people with the filter view checker. You will have a deadline at that point 48 hours post that ping to check over your records and our records and let us know about any issues which we will spend some time fixing. Thanks for all the support last week and from all of ice we hope you have an amazing Gala! An event 1000 years in the making unfolds before all of Sornieth during this year’s Crystalline Gala. 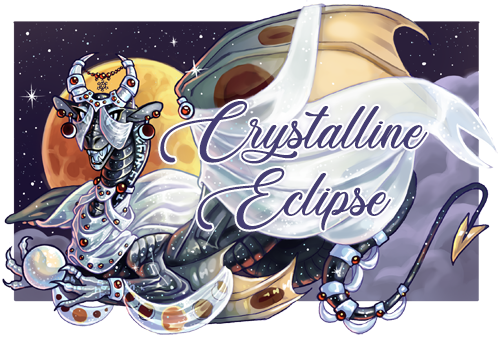 Myth, magic, and a total lunar eclipse transform the Southern Icefields into gathering place where all of Sornieth can come to participate in events, contests, and stargaze during the week of the long night. Who from your clan will journey to participate in the festivities? In addition to enjoying the festivities, dragons visiting from outside the region have another job to do. To aid in the search and capture of Hati, out of flight dragons are needed to celebrate and draw attention to the moon so that Hati never gets a chance to swallow it unnoticed. The more eyes on the ground and in the sky, the sooner Hati can be captured and returned to confinement. » This Raffle will run from January 20th until January 26th at 23:45 FRT. » Prizes will be drawn starting on February 6th. This is because some events taking place during the festival week will award OOF raffle tickets. »People will be pinged around January 28th to confirm their raffle tickets are accurate. Iit is much easier if we are alerted to a problem in recording close to when it occurred. Please try to check your dragons’ information as they are being recorded (or on the following day on master tab) and contact the person you sent the dragons to (if same day problem on recording) or jbapple (if data is already on mastersheet) if you notice any problems with missing bonuses/recording issues. » Drawings will be made using a random number generator on random.org. » You are only eligible to win one main drawing prize. » Winners will be drawn in batches of 10. » If you are pinged, you have 24 hours to respond with your prize preferences. » If there is no reply after 24 hours, you will go to the bottom of the next drawing. » If after the 2nd chance you still haven't replied, your ticket will be discarded. However, you will be eligible to be drawn again. » This will continue until all the prizes have been awarded. » The raffle is open to members from all flights except Ice. Icicles can go here to check out the In-Flight Raffle. From January 20th 00:30 FRT to January 26th 23:45 FRT, we are accepting dragons in exchange for treasure, gems and raffle tickets. 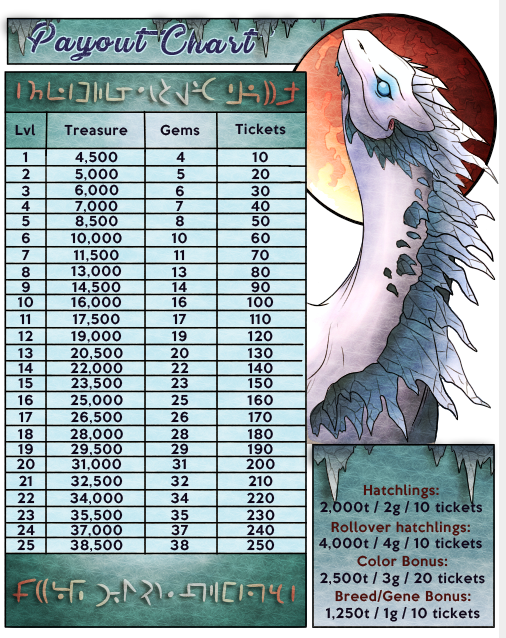 » Please refer to our spreadsheet to find an attendant who is available to receive your dragons! » Dragons sent in via CR or PA for 0t or 1t earn triple tickets! »Tickets may additionally be purchased at 1 ticket for 1000t or 1 ticket for 1g. PM funds (subject: OOF ticket purchase) to jbapple and they’ll be added to the raffle spreadsheet. »In order to reduce lag, ticket entries will be moved onto the Master Sheet at rollover every night. The leaderboard on both sheets is cumulative and takes into account current day and all past days. use This Form to signup for a daily ping when I update the daily badges each day. missed a daily badge and want to claim in future days? send a 1t trade for a single dragon to make up for any daily badge you want to claim. Support us by using these graphics in your forum signature. Thank you to WhistlewindWolf for the design and yyalls and Anivia for typesetting! Visit the Crystalline Gala Hub linked below to check out more events happening this and next week! Thank you to all of our out-of-flight friends for their support. Thank you to all of our receivers for their hard work. Thank you to every one of our donors who helped make this raffle happen. Credit: Snapdragoon (#37632) for the wonderful banner. Credit: Feral71 (#292197) for the awesome tiered badges. Credit: MiniCrisp (#437684) for the cool daily badges. Credit: Daine (#225044) for the headers. Credit: WhistlewindWolf (#152703) for the fantastic signatures. Credit: Feral71 (#292197) for the marvelous dividers. Credit: yyalls (#133347) for the lore blurb. Credit: yyalls (#133347), Anivia (#45483) for absolutely wonderful typesetting. Thank you for participating and supporting us! Can you take 16 level six dragons for treasure through pa? 2 have the gene bonus.